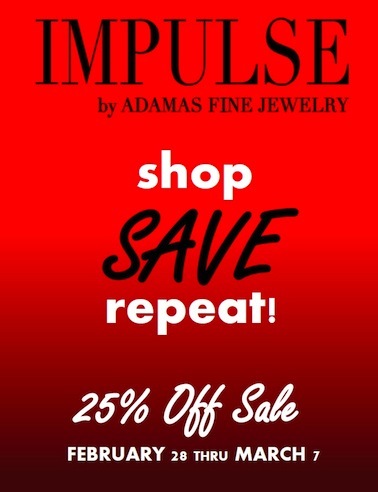 Adamas Fine Jewelry | IMPULSE by Adamas Fine Jewelry – Sale! Visit Adamas Fine Jewelry’s sister store IMPULSE in Wellesley and melt your Winter blues away! It’s the sale you’ve been waiting for! February 28th thru March 7th save 25% on designer jewelry. PLUS spend a pre-sale total of $1,000 or more and receive a one time 20% savings pass to be used anytime in 2015. So SHOP, SAVE, REPEAT…Enjoy!